Navy blue and lighter blue shades are popular these days. When paired with white and gray, they work well and can lend any kitchen a fresh, trendy look. As blue provides a feeling of calmness and order and is definitely a kitchen make-a-statement option, consider introducing this color to your kitchen. Whether teal, turquoise, or robin’s egg, any shade of blue will add a coastal or nautical look. In addition, blue goes really well with almost any kitchen style, from traditional country to modern, even a farmhouse kitchen could be in blue. Actually, when done right, even a tiny accent in blue turns into a fascinating addition to any kitchen. So, if you want a kitchen with its own charm and personality, forget about the neutrals, go bold, and opt for a blue kitchen. Whether cabinetry, a kitchen island, dishware displays, window treatment, floor tile, or backsplash – there is an array of options to introduce pops of blue and lend your kitchen a vibrant, fresh look. With so many design solutions to choose from, it is up to you to make a decision, your only limit is your creativity. Blue is your favorite color? Painting your kitchen blue is a fascinating way to create a space with tons of charm and personality. If you start a new kitchen, plan carefully the color of the cabinetry, flooring, countertops, appliances, and backsplash you are going to incorporate. In case you are planning to change only the wall color, make sure the shade of blue you choose will work well with what you already have in the kitchen. It is scientifically proved that when used as a main color, light blue has a calming effect, lends a fresh, clean look , and pairs well with white and gray. For a country look, choose powder blues. 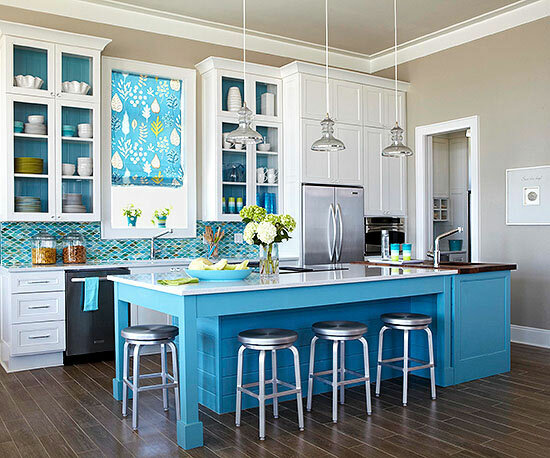 Other shades of blue that work well in kitchens are the uplifting aqua blue and the more neutral grayish blue. From the darker shades, cobalt and deep navy blue/ paired with white or gray accents/are also fabulous options. Note that cobalt blue can definitely lend a sophisticated look to any kitchen. As blue is directly associated with the sky, painting the ceiling in a soft, light shade of blue to mimic the sky is a stunning way to introduce this color to your kitchen. In addition, a light-blue ceiling makes any space feel larger. In the picture above, a country kitchen in French blue. 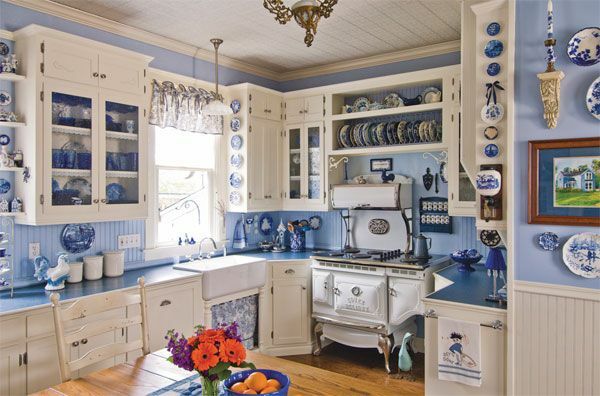 The timeless blue-and-white combo definitely lends a fabulous look to this Farmhouse-style kitchen. Apart from the blue walls, countertops, and window treatment, beautifully displayed porcelain dishes, cups, and accessories add some extra blue magic. Antique items bring in touches of uniqueness. Flower and fruit arrangements add splashes of color and freshness. Definitely an impressive kitchen! Shown above, an airy eat-in kitchen. Light blue walls and countertops, a farmhouse-style sink, a stunning ceiling, gorgeous flooring… Accessories add extra visual interest. Dark natural wooden floor and blue elements work well together to create this fascinating, cozy space! Painting the kitchen island and cabinetry in a shade of blue is another option to introduce this versatile color to the cooking space. Softer shades look beautiful on islands and cabinets, especially in kitchens flooded with natural light. Note that colored cabinets can be balanced with neutral walls or natural materials, such as wood floors. If you want to add some blue to a predominantly white kitchen, painting the insides of glass-door cabinetry can definitely add visual interest and personality to any kitchen. Above, a dream-come-true Farmhouse-style kitchen in Robin’s egg blue. This soft shade used for the cabinetry and the island lends the space a clean, classic look and creates a relaxing atmosphere. Natural wood creates a sense of warmth and coziness. An eye-grabbing chandelier and accessories add some extra color, appeal, and visual interest. Cut and potted flowers bring in freshness. Definitely a unique kitchen! 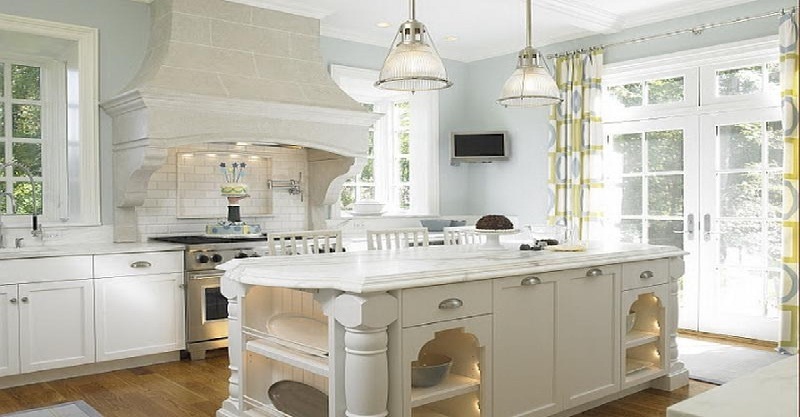 Usually, pastel blue is a favorite option for kitchen islands and cabinets, especially in traditional kitchens. 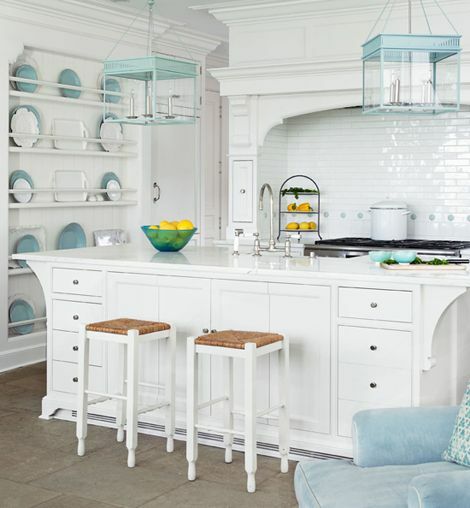 In the picture above, a cozy cottage-style kitchen in a pastel-blue-and-white color scheme. 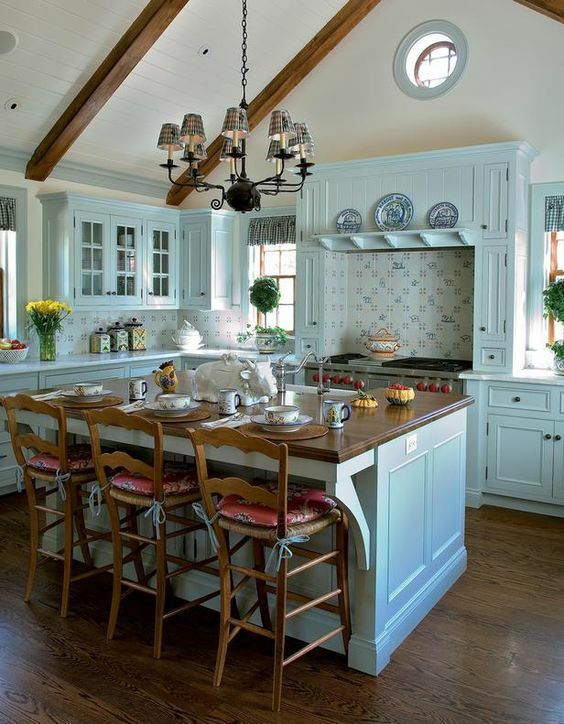 Custom cabinetry in pastel blue complemented by a large island in the same color creates a relaxing atmosphere. Barstool and chair cushions add color, pattern, and texture. Flower and fruit arrangements add extra color and freshness. Undoubtedly, an eat-in kitchen with character! However, you can always forget about the pastel, soft shades and go bold to create fabulous kitchens. Shown above, a fascinating kitchen with tons of charm and personality. 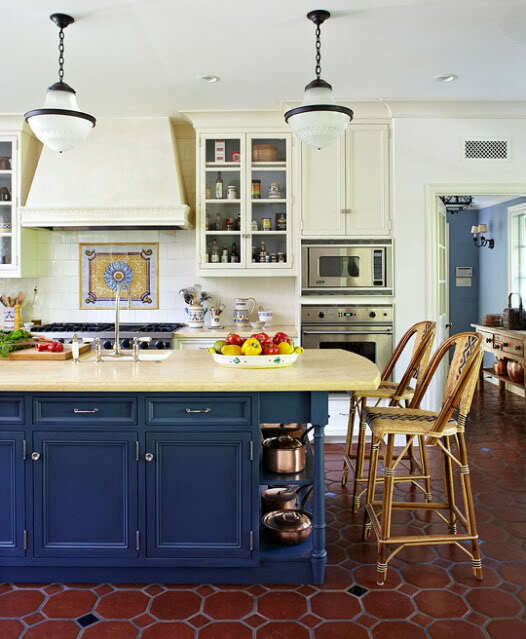 A dark-blue island with a yellow countertop creates a bold, dramatic focal point. Blue diamond-shaped accent floor tiles tie the island to the floor. Unique bar stools, an attention-grabbing mural beneath the hood, copper pots, and stylish details add visual interest. A vegetable arrangement brings in extra color and freshness. 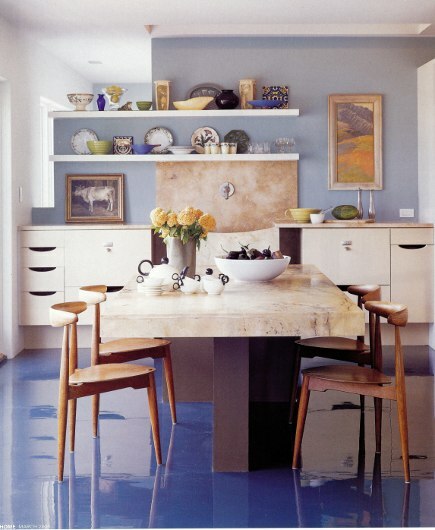 Unquestionably, a creative way to use blue in a kitchen! As blue is commonly used in coastal-style kitchens, incorporating a beach-inspired backsplash is always an intriguing option. 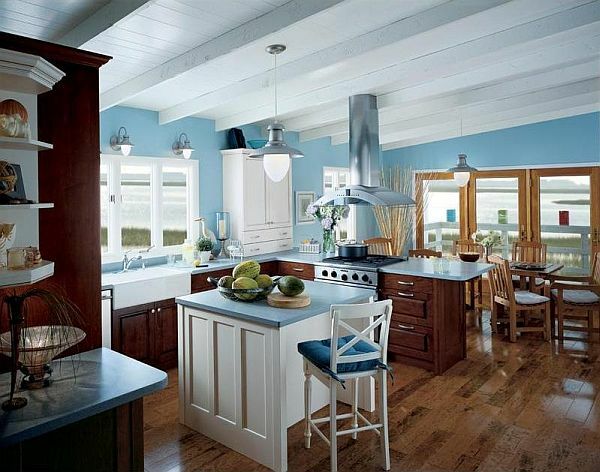 In the picture above, a charming beach-style kitchen. A shimmering backsplash in turquoise and green complemented by accents in the same color scheme and a bold blue island stands out against the background of the taupe-colored walls. 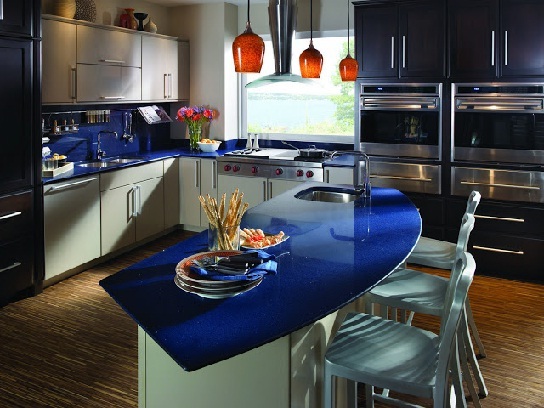 Although blue countertops are not a common option, when used, they usually make a bold statement. Above, a fascinating contemporary kitchen. Unique countertops complemented by a backsplash in the same shade of blue add exotic, dramatic touches. A trio of pendants adds extra visual interest. Cut flowers bring in some extra color and freshness. This is definitely a kitchen with attention to detail! If you want to create one-of-a-kind kitchen, incorporating a blue floor is undoubtedly an option to achieve an unmatchable look. However, if you choose to do so, keep other décor items neutral to let the floor stand out. Above shown is a kitchen of minimal design with poured epoxy resin flooring. Apart from its affordability, durability, and practicality, this cobalt blue floor lends a sleek, modern, unique look to the space. A stunning marble-slab dining table, a massive freestanding limestone Farm-style sink, elegantly displayed accessories, and pieces of art add extra doses of appeal and visual interest. What a way to add blue to a kitchen! Area rugs, window treatment, chandeliers, vases, dishware, chair and banquette upholstery, banquette throw pillows, even flowers are options to add pops of blue to any kitchen. In the picture above, a delightful almost all-white kitchen. A statement floor-to-ceiling plate rack serves double – as storage and display space for beautiful dishware. Lantern-inspired fixtures dropped directly above a unique large island introduce pops of blue. Seagrass stools add an organic feel. Blue is a versatile color, which, depending on the shade, creates from fresh and soothing spaces to invigorating and bold ones with a dramatic, enchanting look. Not to mention that this color is an option to add attention-grabbing accents. In addition, blue works well with almost any design style, from traditional to contemporary to ultra- modern. So, if you do love blue, it can be incorporated in any kitchen to refresh its look. Whether walls painted in blue, blue islands and cabinetry, or subtle blue accents, it is all up to your taste and preference.